In the misty mountain tops or deep in the forests lived the patupaiarehe – fairy-like beings who were seldom seen. They could lure people away from safety with the music of their flutes, and had magical powers and special knowledge. Some believe that red-haired Māori are their descendants. 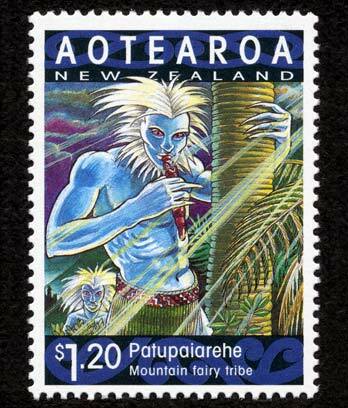 In Māori traditions, patupaiarehe are fairy-like people who live in the forest or on the misty mountain tops. Sometimes they are called tūrehu or pakepakehā. Patupaiarehe had light skin and red or fair hair. They did not have tattoos. Some people said they were small, and others said they were a normal size. In Whanganui stories, patupaiarehe were giants. Patupaiarehe were seldom seen. They were thought to live in several places in the North Island, including in the Waikato, around Rotorua and in the Urewera mountains. They also lived in some places in the South Island. Patupaiarehe were afraid of the light, and were only seen at twilight or in the mist. They wore mats and red flax clothes, and could sometimes be heard playing their flutes. Ponaturi were another fairy people who lived in the sea. They had red hair, light skin and long claws. They only came onto land at night. What happened when they met people? Sometimes patupaiarehe would put people under a spell and steal them away. They made love to beautiful women, and some people thought their children were the redheads called urukehu. To keep them away, people would paint themselves with smelly mixtures, or cook food, because patupaiarehe hated the smell. Fire and light would also frighten them away. Patupaiarehe sometimes taught people magical chants and other skills. They were good at fishing, and one chief spied on them to learn how to make nets.